Chrome, also known as Sky-Earth Non-Metallic Metal, is achieved by painting the mini with blues, white and browns to simulate the highly reflective surface of the metal. The goal is to trick the eye into believing the surface is reflective and not matte paint. It's a tricky technique, and so far has seemed fairly difficult to pull off. 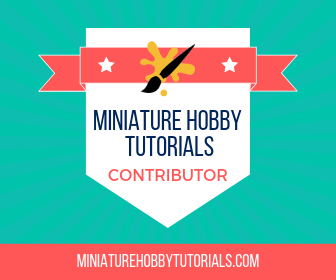 In order to do it, you need to be skilled in wet blending and have an eye for how light reflects and wraps around the surface. I've done a decent amount of wet blending, but I've not fully mastered it. The way light refracts and bends around metallic objects on the other hand has always boggled my mind. 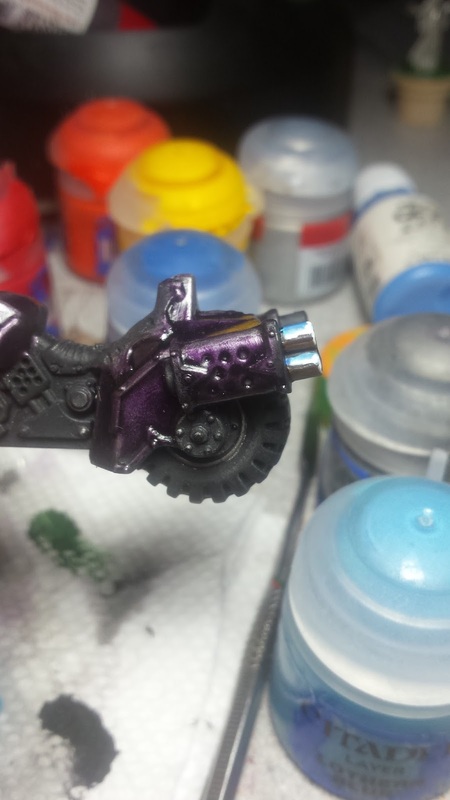 Using the Chaos Biker motorcycle, I started my first attempt at SE-NMM. I started small and used a pair of tail pipes as my victim subject. This is the same bike that I used to test the purple for Sophie's bike. I started with the browns first, which I think was a mistake. Also, I had trouble keeping the paint consistency from getting to thin. This and my normal paint palette didn't do a good job of keeping the paint wet, even with Slo-Dri medium mixed in. Which means I may need to look into making a wet palette. It turned out alright, and folks could tell what I was going for, but I felt it wasn't up to par... I was also using smaller brushes, and I'm not sure if that was a good move or not. After the bike tests I tried doing a larger surface and went with a High Elf shield from Warhammer. I also started on this with the browns first. The whole time I was working on it, I didn't think it was turning out right, but couldn't put my finger on it. It wasn't until @KujoPainting pointed out that my reflections were way off. That made me realize that on this one, I failed to read the surface correctly and reevaluate it. I'll be redoing it soon for more practice. But with Christmas in a few days, finding time to paint has been a bit difficult. But, after Christmas, it's a week off! I should be able to knock out a lot of painting then. 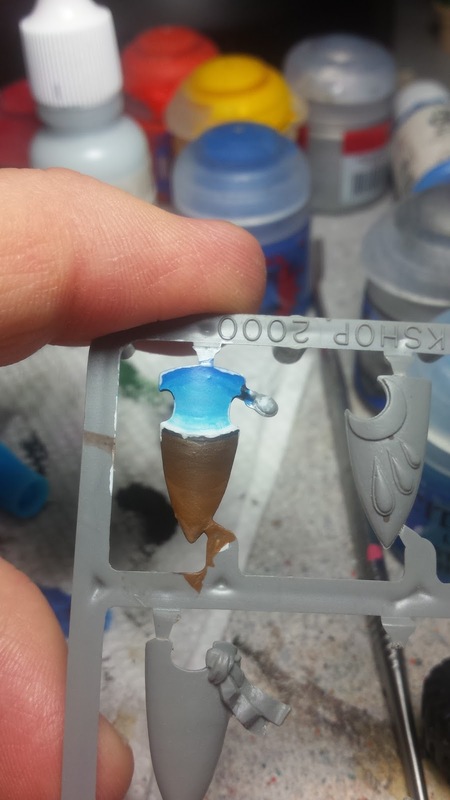 I look forward to hammering out this SE-NMM technique and add a new skill to my painting tool bag. For it to really work, I think I need to push my contrast further as well. Which has always been a weak point in my painting. I also need to solidify my wet blending skill to get better transitions of color. Time to look up some video tutorials and get to work!